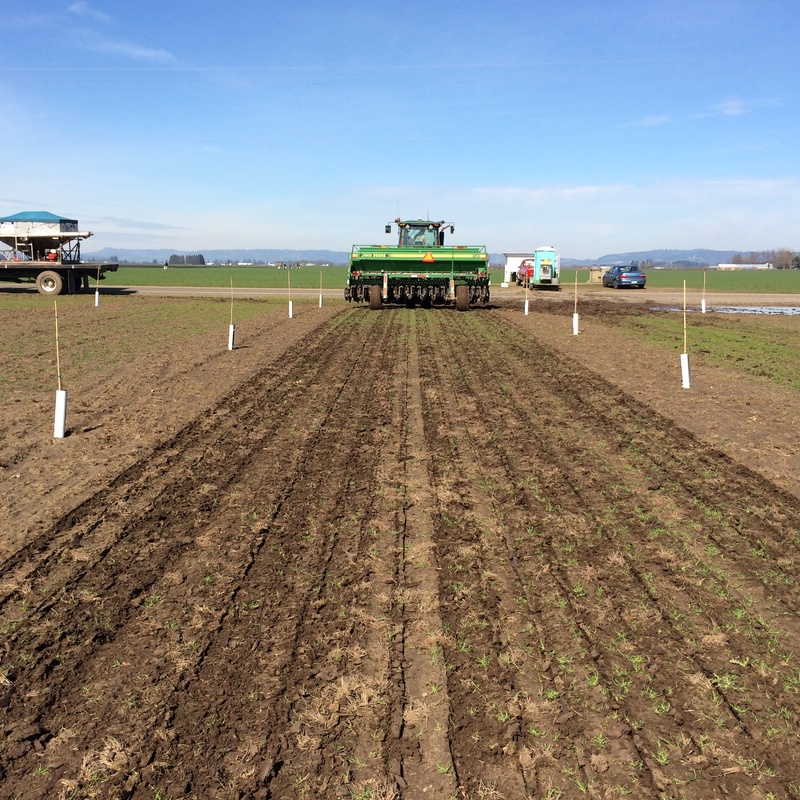 As I put up last week, we planted a fair amount of our spring wheat with the nice weather. 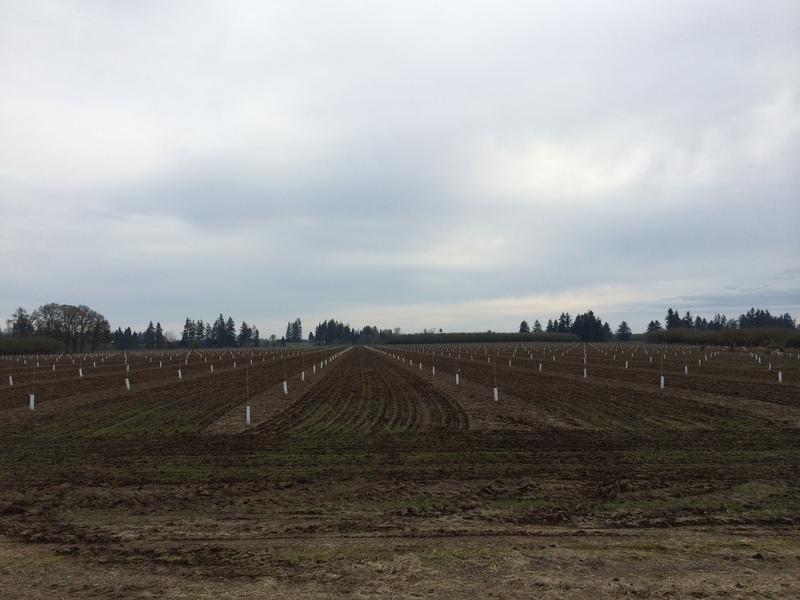 We didn’t just plant into open fields however, we also planted in between where we put our new baby hazelnut trees this past fall. Hazelnuts take about 4 years to get large enough and have enough crop on the trees to make them worth harvesting. So instead of letting our ground sit with no crop on it for 4 years, loosing income, we inter-plant. In years past we have done a rotation of wheat, followed by crimson clover, then followed by one more crimson clover crop. 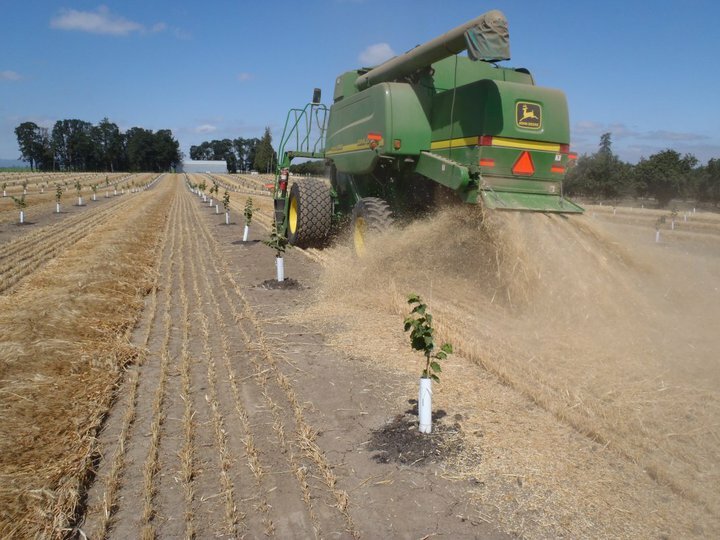 After that the trees are a little too big to get into the field with the larger equipment necessary to harvest the inter-crop. It does get a bit tricky at times, with ways that you can manage the trees alongside another crop. But we have found that these two crop types, wheat and crimson, do a very nice job. Beyond the economics that you can get a little income off your ground for a few years, an added benefit is that you don’t have to spray for weeds on the bare ground for 3 years, with a crop on the ground it will help shade out unwanted weeds. This is a photo of our first wheat crop in between hazelnut trees 5 years ago. The major change was that we had to swath (cut down) the wheat instead of harvesting it while it was standing. This was because our wheat header was too big to fit down the rows. At our farm even with 1000 acres to work with, just loosing 27 acres to a crop that won’t be harvest-able for another 4 years puts us in a pinch. So we do what we can to make sure we are utilizing the land that we have. What variety of spring wheat did you plany this year? Hey Rob, We planted Diva.